After we posted in early April that we had put out some bird cottages in the RainyDayGarden, a few readers suggested we also put out a house or two for Mason bees. While we know nothing about keeping bees, we have always been intrigued by the thought. Mason bees get their name from the way they seal their nests (after laying their eggs) with a mortar-like application of mud, like masons with masonry. 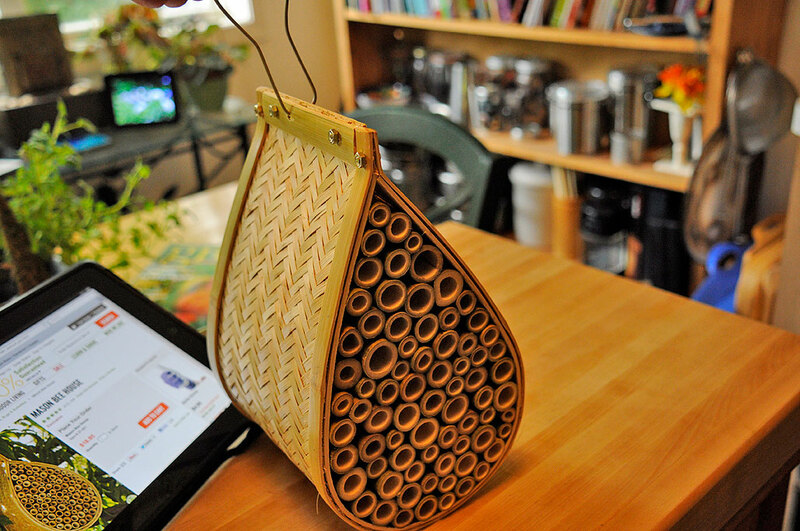 There are a lot of DIY ideas for making Mason bee houses, but we found a very attractive ready-made version from Gardener’s Supply Company. 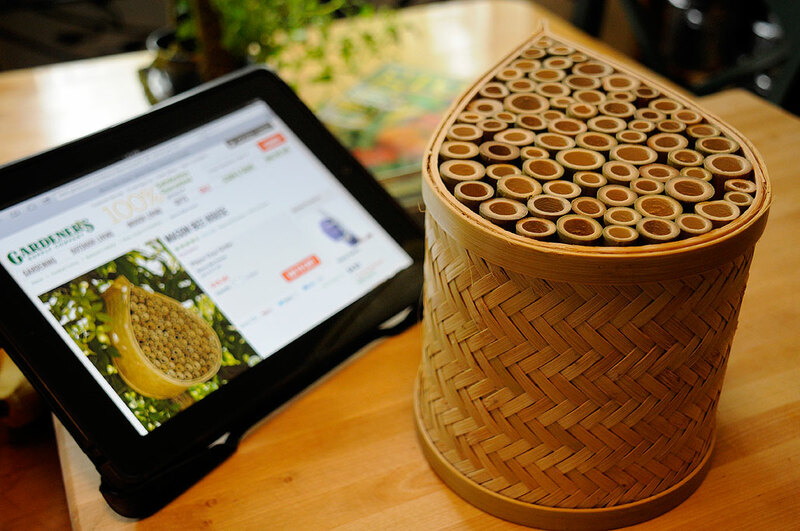 The house is made entirely from bamboo, has about 75 tubes for the little buzzers, and comes ready to hang. The directions suggested we hang the bamboo house against a tree or wall where it will get morning sun and attract mason bees. We found a nice spot under one of the Japanese Maples. It will get the morning sun, but will be gradually be covered by shade later in the afternoon. We hope the bees will find it suitable. Mason bees (genus Osmia) are a type of native bee that’s quite common throughout most of the U.S. Different than honey bees, Mason bees do not sting or produce honey. They are usually a little smaller than a honeybee, and typically metallic blue or blue-black in color. They are apparently incredible pollinators. Each bee may visits as many as 1000 blooms per day, which is about 20 times as many as a typical honeybee! Bees have been having a very hard time in the US of late. No one really knows why, but they have been dying in large numbers. 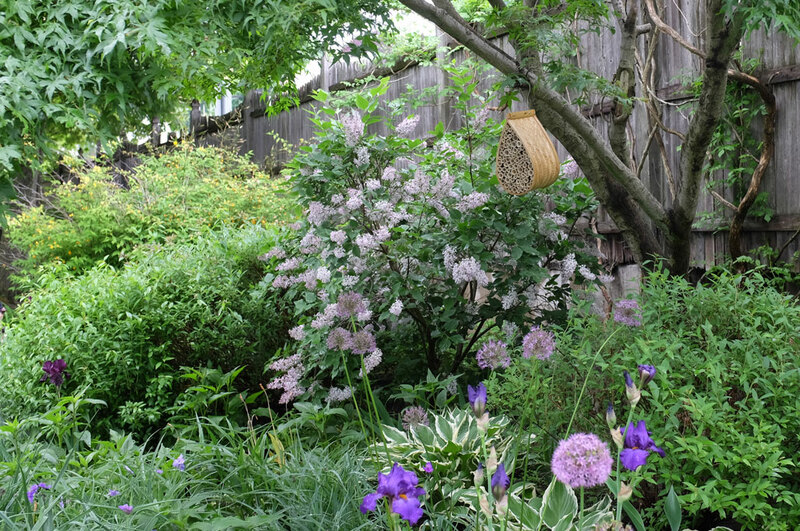 The RainyDayGarden, with the constant blooms, has always been bee-friendly. We are glad that it is now even friendlier 🙂 If we are successful in luring some Mason bees to set up house, we will put up a few more next season. Can never have too many bees in the garden!